A 17th Century barn lovingly converted into quality self catering accommodation and equipped to a high standard. Next door to the owner’s home in the picturesque Mayfield Valley on the outskirts of Sheffield. Views of green fields extending towards the Peak District National Park. 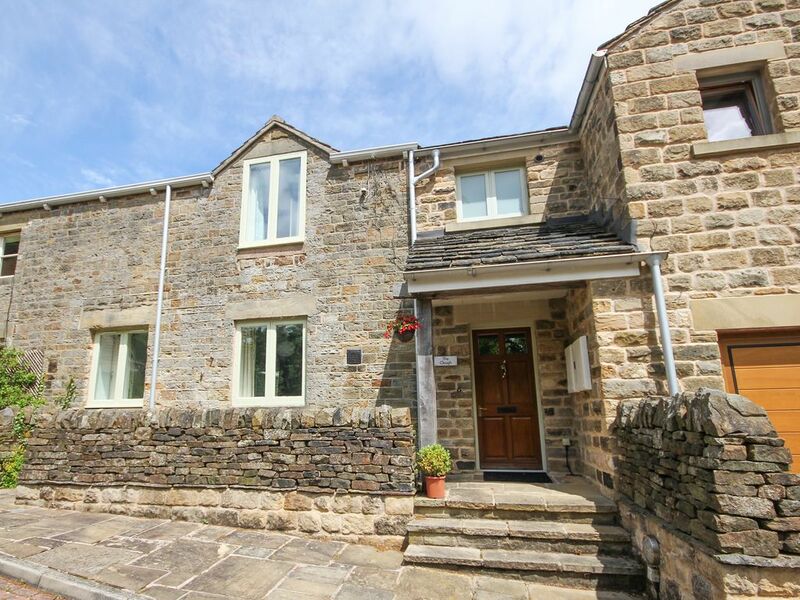 Close to Sheffield with easy access to the Peak District and beyond. The local shops and facilities are just a kilometre away. Open plan living and dining area with TV and DVD. Cooker, hob, microwave, fridge, freezer, dishwasher, washing machine, tumble drier. Notes on accommodation: No smoking. Pets welcome. Unsuitable for allergy sufferers and no facilities for very young children. Outside: Parking is available for two cars directly outside the cottage. To the rear of the property is a private and secure garden suitable for young children and pets. Cleaning / Towels / Linen / Maid service: The cottage is cleaned weekly and includes linen and towels. It is one of the best places we have stayed in. Very clean and comfortable accommodation a quality place and caring owners. Some small issues with shower water not being completely sealed in the bathroom and some black discolouration in places but not a big problem would certainly go there again. Perfect place for grandson’s half term holiday - great location and lovely house. From the moment we entered the front door it was obviously what we wanted. The house was clean, stylish and very well equipped. The owners were friendly and helpful. We managed our two dogs with ease - the fence enclosing the small garden needs a little attention but not a major problem. We would certainly consider staying at The Clough again. Lovely house, outstanding location and wonderful hosts! We booked a last minute stay for our family of 4 plus our dogs. Bre kindly let us borrow her grandchild's travel cot and high chair which made things much simpler for us and our 14 month old. Not only that but on arrival Bre and Neil had set up a wendy house and tractor toy that belong to their grandchildren for our children to use, which was very thoughtful and kind. The house itself is spacious and very well equipped (lots of good cooking items including knives that are actually sharp! The dishwasher, washing machine and drier made life easy too) with a lovely garden table and lawn to enjoy looking out onto fields - the whole area was quiet and serene. The entrance hall has doormat type carpet and leads to a cloakroom with tiled floor which gives ample space to take of wet gear before going into the house proper, and these are many coat hooks and shoe rack. We found this area extremely useful for drying the dogs and generally stopping wet clothes/shoes from ending up in the house! The good sized bathroom was also great for family bath time, with a big bath and lots of space to move around. There are lots of quiet country lane walks right outside the property which was great for quick morning/evening walks with the family and dogs. The house is also only ~15 min from many large shops, ~5 min from a post office and smaller supermarket and only ~10 min from the car park at the top of Burbage valley, giving quick access to the valley and also the incredible Stanage Edge. This area of the Peaks is so densely packed with interesting things to do, from climbing, walking, enjoying small villages, historic sites, cycling etc. and the Clough puts you withing easy reach of it all. Bre checked in with us a couple of times during our stay to ensure we had everything we needed which was greatly appreciated, and she kindly allowed us to extend our visit by an extra night as we didn't want to leave! We would definitely come here again as it was a lovely place to stay and Bre and Neil were great hosts. Thanks for having us! A fabulous well presented, and clean cottage. A great location for the City and local walks into the country side. We hired the cottage for a week running up to our Daughters wedding. We had 3 bridesmaids, the Bride, the hairdresser, photographer and the 2 of us in the cottage on the wedding morning, and still plenty of room to move around. We will definitely book again. Bre made us feel very welcome,and a nice touch with a jar of home made honey. We had a wonderful week at The Clough visiting our son at Sheffield University. The location was absolutely perfect as we were only 10 minutes away but we could take the dog and walk out of the front door into the countryside. The house itself had everything we needed and even some homemade jam and honey waiting for us when we arrived. We will definitely be visiting again. What a great cottage in a wonderful location. A very well equipped home away from home. Close to town and shops but in a great country location. The new born lambs were the noisiest things around. Would definitely stay here again and recommend this cottage. After 10 crazy days this was very relaxing and tranquil 5 night break. Sheffield City Centre 5 miles, edge of Peak Park 1 mile. 10 min by car from the city centre and train station. The local shops are within a kilometre and include an off licence, Indian takeaway, post office, butcher, newsagent, supermarket and greengrocer. The local pub is the same distance in the opposite direction and serves food for most of the day. Booking Notes: Please ring for confirmation of availability or visit our website, ask about our mid and weekend rates for mid and low seasons. Deposit of 10% on booking. Changeover Day: Friday change over arrival after 2pm, departure before 10am. Notes on prices: Prices are for the property per week in UK pounds. Discounts available for periods of three weeks or more. Short breaks available by arrangement. Pets £10 / week.